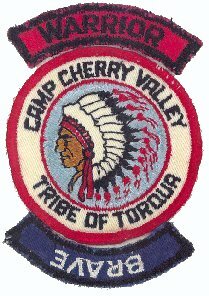 Tribe of Torqua - Camp Cherry Valley, California, (still exists there). It says: A special group of honor campers who attended summer camp at Camp Cherry Valley, on Catalina Island, California. The "Tribe" was instituted by Council Executive, H. Benjamin "Skipper" Robinson many years before.